What factors contribute to floods? What are the consequences of floods? How do we forecast floods? How do we communicate and warn about floods? How do we estimate the chance of a flood occurring? How do we manage flood risks? Read why the report was prepared. Read about the Working Group and a Review Group vital to this report. Read about flooding in Australia and what can be done to reduce the risk. Read about rainfall, catchments and river characteristics. Find out about the social, financial and environmental impacts of floods. Read about weather, seasonal, river level and flood extent forecasting. Improving our warning systems could reduce losses from floods. What is the probability of experiencing a given size flood once or more in a lifetime? 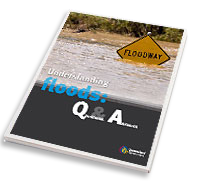 Find out about floodplain management and flood modification measures that help to reduce risk. Read about climate change and what can be done to mitigate the impacts of flooding. A summary of key flood terms and definitions. Some helpful resources on how to prepare and plan for floods. See the list for more information. To continue to improve your experience we need your feedback. Tell us what you think about this page by completing the questions below and giving us your own words in the ‘Your comments’ section. Contact Please provide your phone number or email address if you are happy for us to contact you with any follow-up questions.